Description: Came in an over sized box with Character Stylus. Box Text: Go on a healthy habits adventure with your Sesame Street friends! 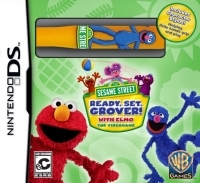 This is a list of VGCollect users who have Sesame Street: Ready, Set, Grover in their Collection. This is a list of VGCollect users who have Sesame Street: Ready, Set, Grover in their Sell List. This is a list of VGCollect users who have Sesame Street: Ready, Set, Grover in their Wish List.